This is part of my series on Theodicy in the book of Job. In Part one we introduced the book, in part two we evaluated the presence of the Free-will theodicy in Job, Now we will examine and evaluate the presence of the Augustinian ‘privation’ theodicy in the text. If God is holy and good, then how can evil come out of His good creation? In a sense this is the question that Job poses in his lament. As it relates to suffering, Job seems to recognize that what has befallen him is a calamity without a cause. “Is there injustice on my tongue?” He asks, “Cannot my palate discern calamities?” For those who advocate for the privation theodicy, Job’s calamites do not arise out of what he receives but rather out of what he lacks. Creation is able to defect, able to foster evil because it is not eternal. God alone is eternal and unchangeable. Creation, is created from nothing/ex nihilo, and as such has the capability to change (and sin) because it is deprived of God’s eternal being. God is therefore removed from liability under this defense because He has not created evil. Privation focuses more on the substance, or lack thereof, than on the actions of mankind. At their very essence, men and created beings are lacking the full measure of divine goodness. As a result, sin occurs causing evil and suffering to follow. Unlike the free will defense, suffering is not seen as a consequence of free will but rather as incidental to the nature of creation. Evil and suffering follow after creation rather than being a response to man’s exercise of will within that creation. 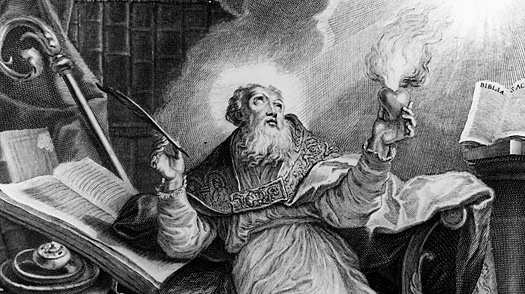 For Augustine, evil is not about our freedom to will but rather the object of our love. Man still wills, but evil arises not because man has the freedom to choose it; evil arises when man loves that which is less than good. Evil then is fundamentally “self-defeating and absurd for the extent to which it succeeds it can only destroy that upon which it lives.” So how does privation manifest itself in the book of Job? And is it a valid explanation for the suffering Job is experiencing? The prologue of Job is permeated with privation. One could even describe the suffering Job undergoes as being defined by privation. The Adversary is seen seeking the removal of all that makes Job’s life outwardly good, all that he possesses. And God allows this activity. Job is deprived of God’s protection (1:12); he is deprived of his flocks and servants (1:15-17); he is deprived of his children (1:19); and finally deprived of his health (2:7). Job’s affliction could easily be described in terms of what he lost rather than on anything that he received. All of this is removed from Job’s life in order to create vulnerability, so that the Adversary may deprive him of the one thing that made him righteous; his character and fear of God. Any reader of the text could argue that it is in fact God who has instigated the privation. It is God’s hand that is extended his hand against Job (1:11) and God himself claims credit for the first round of calamities to befall Job. (2:3) To critique this view we note that it would appear that there is an active, substantial element to the existence of suffering in Job’s life. Even though this evil has taken the form of privation; the existence of God’s action in this passage seems to do a disservice to the elements of privation. We now turn to examine privation in light of the poetic dialogues. Job has lost all that is dear to him and in the dialogues he will even lose those who have come to comfort him, his friends. Job complains in chapter 3 that the evil he has experienced has not gone far enough. He longs that the world be deprived of the day of his birth, even the night of his conception. If there is any redemptive purpose to such suffering it is lost on Job. Indeed all of creation seems flawed in light of the misfortune that he has experienced. His question in 3:23 gives some further support to those who would advocate a privation defense. He states, “Why is light given to those whose way is hidden?” Put another way, a hidden way (life) is a life deprived of purpose and focus. If one’s life lacks purpose, why is he given life to begin with? Job’s friends add insult to injury by depriving him of their support and lending him their criticism. But beyond their withdrawal of support, there is little evidence that Job’s friends subscribe to a privation explanation of evil. While they might acknowledge that evil and suffering sometimes occur in the form of privation, the deprivation of God’s favor, the loss of wisdom etc. For the most part they all seem to be focused on the will of Job and on how his actions, hidden or exposed, have derived negative consequences. Zophar appears, at one point, to define evil in terms of privation. In chapter 11, he posits that Job is in fact morally defective due to hidden wickedness. Here he is arguing against Job’s innocence in terms of what he must do to make a mends with God and forget his troubles. According to Zophar, the wicked lack sight and Job has previously confessed to having lost his sight due to his malady. The wicked also live for their final breath, Job too has been robbed of steady breathing. Job appears to be the picture of one effected by a privation of goodness. But Zophar does not see this as merely incidental, rather he sees Job’s affliction as being a consequence of wickedness, and therefore aims to convince Job to confess thereby remitting what has befallen him. So there appears to be little support within the dialogues for a privation view. It is not necessarily a detriment that this perspective is not present in the dialogue of Job’s friends. For their methods and views will later be rebuked by God in the Divine speeches. We will now examine privation in the divine speeches. Interestingly enough, God’s proclamation of his ever-present sovereignty against the smallness of man, lends itself to a privation defense. God is all-powerful, the master of all the created universe. Able to observe the remotest star and the loneliest animal giving birth. Man by contrast is limited; unable to discern the scope of God’s creation much less the purpose behind it. It is just this creaturely construction that makes mankind prone to evil and susceptible to suffering. Key to the notion of privation is that man is capable of flaw do to the fact that he is not God. God does not respond to the actions of Job’s will, rather he objects to Job’s lack of understanding. “Who is this that darkens counsel by words without knowledge?” God gives added to idea of evil as privation when he restores Job at the end. Good comes to Job when he is restored, surpassing his former state of goodness. “God’s intent is to show that a human being can love God, and pursue righteousness without receiving any prompt reward. This pursuit of God is therefore independent of material comfort; it may be in defiance of material comfort. Satan’s thesis, that all religious interest is ultimately grounded in self-interest, or worse, in mercenary commitment, is thus shown to be false. While there are some elements that ring true regarding the privation defense, in and of itself proves somewhat lacking in tackling the evil and suffering we encounter in the book of Job. So if “free will” fails, and privation is inadequate is there a satisfactory system to account for the evil and suffering that Job experiences? We shall now in the final section propose such a system, define it, evaluate it against the text and draw our conclusions. Augustine of Hippo, The City of God, Kindle Electronic Edition: Book IX Chapter 1, Location 7221-24. John Hick. Evil and the God of Love. San Francisco: Harper and Row. 1978. 48. Job 11:14-15 Zophar states, “do not let wickedness dwell in your tents; then indeed you could lift up your face without moral defect.” Removing the wickedness allow Job to “be steadfast and not fear, for you would forget your trouble.